International Institute of Marine Surveying, in association with Broadreach Marine Ltd, is pleased to announce the development and launch of a unique training opportunity. 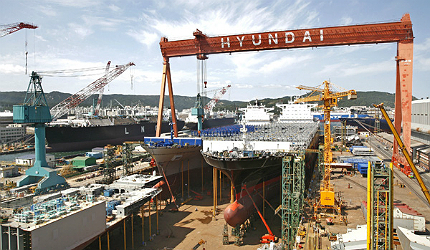 The two week Shipyard Acquaint Course is planned to take place during March 2018 in and around the major ship building yards of South Korea. To provide an opportunity for the student to gain an understanding of shipbuilding, from placing a contract to delivering a completed ship, with supervised access to and against the backdrop of the largest shipyards in the world in South Korea. Peter Broad is the lead course tutor. He has spent his entire 30 year career in shipping. Peter has always worked to the highest possible standards and has led teams to success and enjoys mentoring others. Over the years, Peter has worked with and managed a number of multinational and multicultural teams and values highly the diversity of these relationships. Peter is the owner and Managing Director of Broadreach Marine Consultants (UK) Ltd (based in South Korea) and is involved with newbuild ship project management, plan approval, marine surveying and marine training. Peter will be assisted in the delivery of this course by other specialist tutors. At this time, expressions of interest are being sought for the course by email from individuals who have a basic knowledge of ‘shipping’ and want to expand their practical knowledge of ship building in particular. However, applications from existing, more experienced marine surveyors keen to extend their knowledge in this area are also welcomed. Other qualifications will be considered on their merits along with an applicant’s previous background and experience. The course will be conducted in English. Students must have a good skill level in both written and spoken English. Students will be required to sit a one hour multiple choice exam on the final day. The exam papers will be passed to the International Institute of Marine Surveying who, as previously stated, will issue the certification for this course from UK. A course attendance certificate with details of the learning outcomes will be presented to each student on successful completion of the course, certified and issued by the International Institute of Marine Surveying. 10 CPD points will be awarded to members of the International Institute of Marine Surveying. Your application is to be submitted via this web site using the standard application form at the foot of this page with a copy of your CV attached. By making your expression of interest in this way you are not committing yourself to the course at this stage. It is wholly at the discretion of Broadreach Marine Ltd, who are running the Shipyard Acquaint Course on behalf of the International Institute of Marine Surveying, as to who will be selected and invited to attend. Selection will be on a first come first served basis for those who meet the joining criteria with a limited number of just 20 places available. If it is deemed that an applicant is not suitable to attend this course, they will be informed by email of the decision. Broadreach Marine Ltd’s decision on candidate selection is final and is not open to discussion or appeal. I wish to register and express my interest in attending the Shipyard Acquaint Course to be held in South Korea from 12 to 23 March 2018. Please send me further information and details.